Over the past week, I was presented with an opportunity that I would like to share with you. The Color Run has given me a $5 off promo code, COLOR5OFF, to share with all of you that will be good for any race that is still currently open. I have a race registration that will be raffled off to a lucky reader, but more about that in a minute. What exactly is The Color Run? Well, for starters, it is known as the Happiest 5K on the Planet, so it has that working for it! But furthermore, it is an event that promotes healthiness, happiness, and charity. 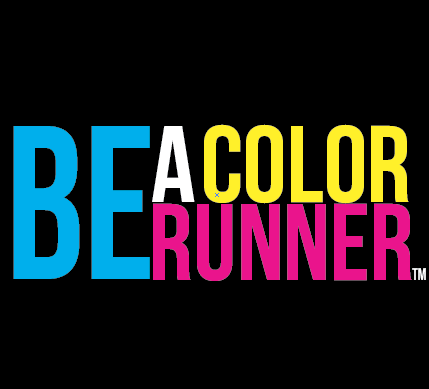 The Color Run is a 5K, but do not let that moniker intimidate you. 5K is simply the distance for the event. You do not need to run a sub 7:00 mile to enjoy The Color Run. In fact, you should leave your GPS watch at home because this will be an untimed, fun run. You are out there to have a good time, not run at a good pace. There are only two rules for The Color Run, which are wear white and finish plastered in color. And do not worry about wearing white after Labor Day (if your chosen event falls then), we won’t tell your mom. The Color Run is a very accommodating race with nearly 70 locations still open for participation! If you are wondering if there is a location near you, the simple answer probably is yes, there is a Color Run near you. 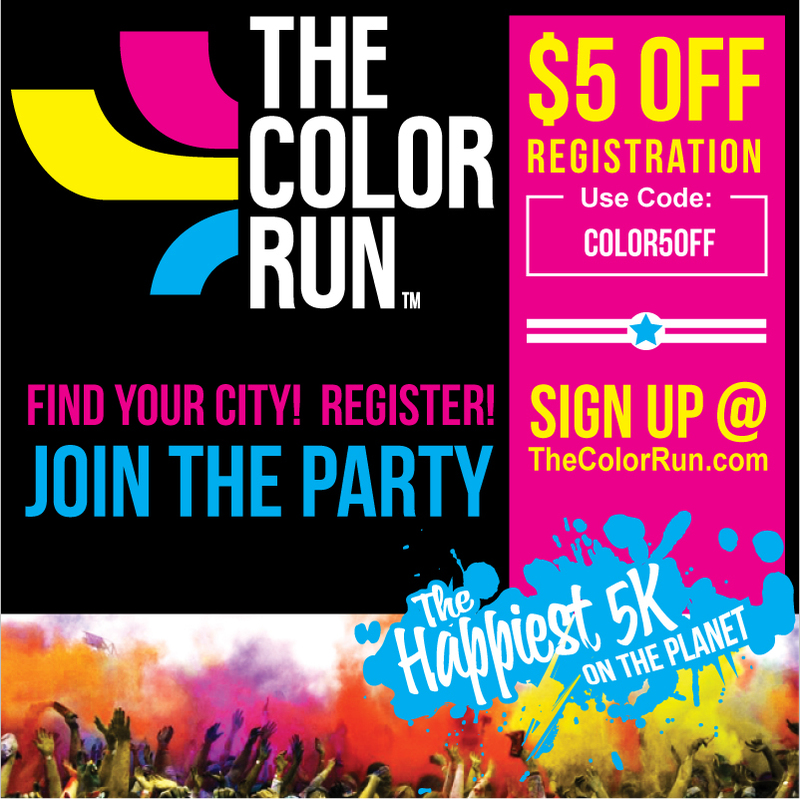 Visit The Color Run page to see all of the locations. All of The Color Run events tend to sell out, so you need to register ASAP to guarantee a spot in the event of your choosing. Another great feature of The Color Run is the ability to run as a team. You may register a team of four or more runners, and each runner will get a $5 discount on their race registration. And this team designation does not disqualify you from the above mentioned promo code (COLOR5OFF), so after you apply that, your registration fee will be discounted by $10! You simply find at least three friends, come up with a creative name, and register as a team rather than an individual. You know that you will have more fun running with a team rather than by yourself! Another phenomenal aspect of The Color Run is that they choose a local charity at each location. And with the lineup of cities, the list of charities helped is quite extensive! Sign up today by picking your desired location (provided that it is not sold out) and also enter my raffle for a free race entry! Do not worry if you win the entry, just give it to a friend so they can run with you! About two weeks ago I was afforded the opportunity to try a beef jerky snack that I had never even heard of prior, Perky Jerky. Now, being a guy of generous proportions, I have enjoyed some beef jerky in my day. My friend Derick and I even bought some from a stand on the side of the road in rural Tennessee once upon a time. But, in my efforts to try to eat a little healthier and take better care of myself, I have abstained from all dried and packaged meat snacks. That period of abstinence is now over. Our story – like most good stories – begins with two Jerks in a ski lodge. After a long, hard night of energy-drink-cocktail-fueled libation, these jerks settled in while the winter storm raged outside. The next morning they awoke, loaded up their gear, and headed out to the mountain. Amongst this gear was an open bag of peppered beef jerky, which had, unfortunately became drenched in some of he energy drink that had been carelessly spilled the night before. On the first lift up, it made no difference. To these jerks, jerky was the only breakfast they needed, altered or not. Much to their delight, the jerky had retained its original flavor, but was more tender by the accident. What’s more, as they floated their way down the mountain through bottomless powder, they realized they’d been given an extra boost – the jerky had taken on some of the pep of the energy drink. On the next lift ride up, the greatest innovation in jerky since cracked pepper was born. Since then, these Jerks developed a very sophisticated process for making Perky Jerky. The result? Just the best tasting, most tender jerky around. The bonus? Perky Jerky is now the ultimate snack to get you up the mountain, down the slope, or off on whatever adventure you decide. After reading that, I was even more excited to give Perky Jerky a try. These two guys would have fit in with my fraternity quite well, I am sure. 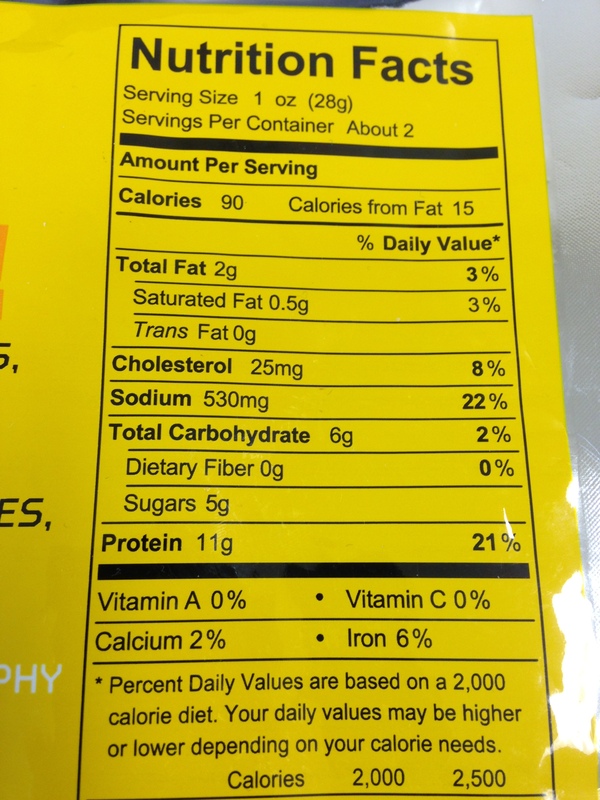 Perky Jerky is an all natural, gluten-free snack, with no nitrates, preservatives, or added MSG. The marinade for Perky Jerky consists of seven natural ingredients, with Guarana helping with the tenderness, providing a little flavor, and adding that boost to Perky Jerky that you would expect from an energy drink. The result is a snack high in protein, low in carbohydrates and fat, and all while coming in under 100 calories per serving! 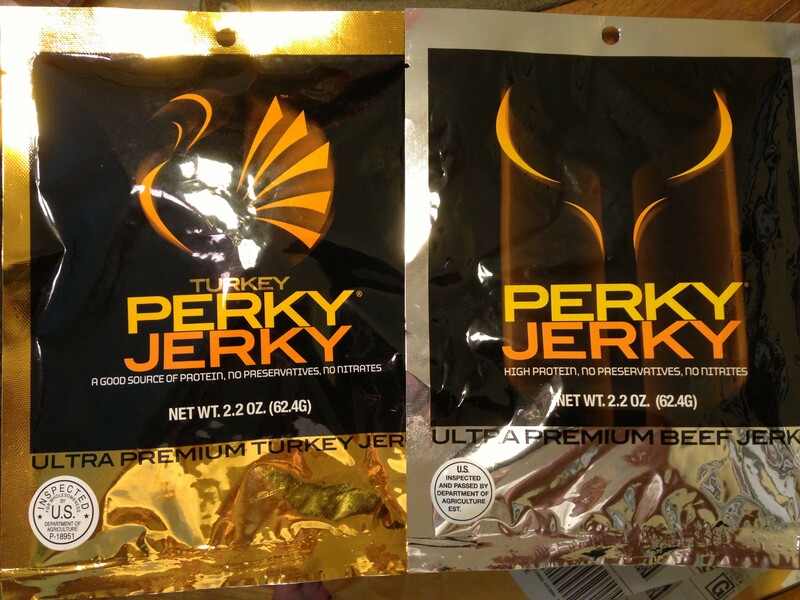 Perky Jerky sent me two samples to try, their regular beef jerky, and their turkey variety. I could not wait to try both, and let’s just say that the samples were not long for this world! In two days time I devoured both samples throughout the course of the day. Day one I tried the beef jerky and day two I tried the turkey jerky. Honestly, I could barely tell a difference in taste between the two which is a great testament to the flavor of the marinade. Both had tons of flavor, and were noticeably more tender than traditional beef jerky. Honestly, I did not notice a significant boost in energy, but I usually do not from these sort of things. I will say unequivocally, I will be purchasing Perky Jerky in the future. Perky Jerky has a total of eight flavors available, and I will sample them all to determine my favorite, I am sure. The flavors are Original, Hot & Bothered, Teriyaki, and Sweet & Spicy. The reason they advertise eight flavors is because these four flavors are available in both the beef and turkey varieties of Perky Jerky. And if the taste, tenderness, and energy boost Perky Jerky provides did not convince you, consider the next positive for Perky Jerky. A portion of their proceeds from the sale of Perky Jerky is used to help support the fight against Duchenne Muscular Dystrophy. The owners have a personal connection to this disease and an intense desire to do whatever they can to fight it. 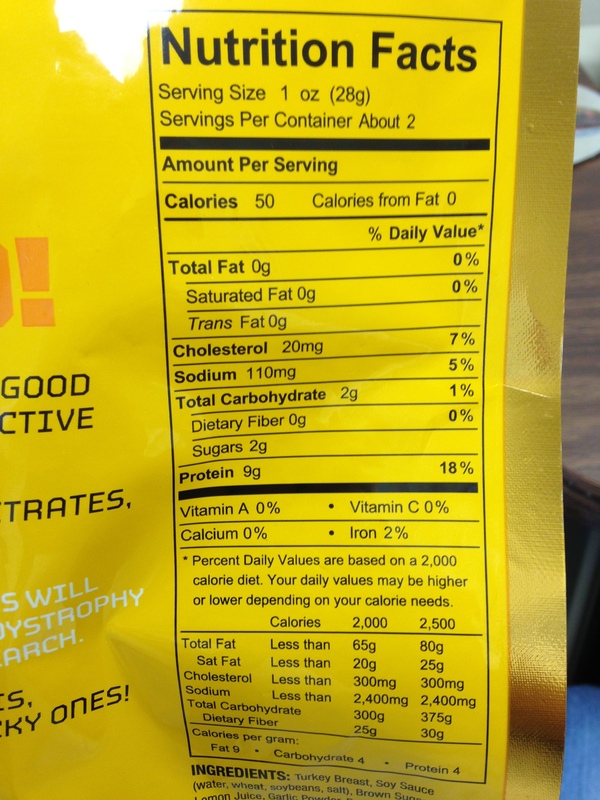 I also have two side notes on Perky Jerky. One, it amuses me that Home Depot and Best Buy are two of the select retailers for Perky Jerky. Two, I love following their Facebook page. They have several giveaways on there and they definitely seem to have fun with what they are doing. OK, all St. Jude stories are probably worth sharing, but this particular one really hit home with me. The story of the University of Memphis QB Jacob Karam visiting some patients at St. Jude Children’s Hospital here in Memphis has been making some national headlines for a couple of days now. If you have not read the story or watched the You Tube clip, stop what you are doing and click this. It is most definitely worth your time. I will spare the majority of the details in the story since you have already clicked on it and I cannot convey the story any better than Mr. Doyel did today. I would just like to add a couple of thoughts. First, how refreshing is it to see an athlete that truly is humble and doing something for others out of genuine decency? If you watch college football on Saturdays, you are familiar with the staged and preplanned media sessions of teams at children’s hospitals. They take a couple of pictures and say a couple of boiler plate interview answers, then they are gone. Back to their lives without another thought about where they just were. Second, how talented are both he people in the video? Breanna had some pipes, and besides being a starting D1 QB (albeit on a rather bad team), Jacob graduated from college in two and a half years, is fluent in Spanish, and can play piano by ear! I listened to him on the Chris Vernon Show today and he played several dozen songs as listeners requested them. It was quite impressive. You should check out the podcast from today. I listened to it again tonight during my run. He also mentioned that Breanna loves Bruno Mars when Grenade was requested. Maybe that was a setup to her name in the segment, but I highly doubt it. I have mentioned it before, by St. Jude is one of the major assets for Memphis and probably the entity in this town that I am proudest about. But, I must say, after hearing this story on Jacob Karam, my pride for my alma mater has skyrocketed even higher. I meant to share this last night, but phone was not cooperating. Well, anyway, I am very excited to give Runnerbox a try! A quick post just to announce the winner of my first giveaway, from Runnerbox! Congratulations to Kyle from Running Large! As you can see, there were almost 300 entries, which totally blew me away. I thank each and every one of you for playing along, for your fun comments on the post, and for the new follows on the blog, FB, and Twitter. It was tons of fun to do a giveaway and to get to know some new people, so I’m going to plan another one sometime soon! 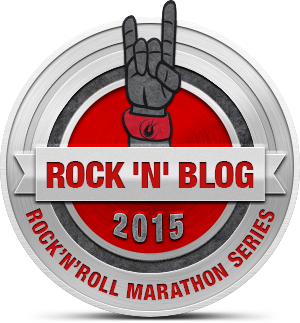 Here is the overdue race recap for my very first attempt at hosting a virtual run. 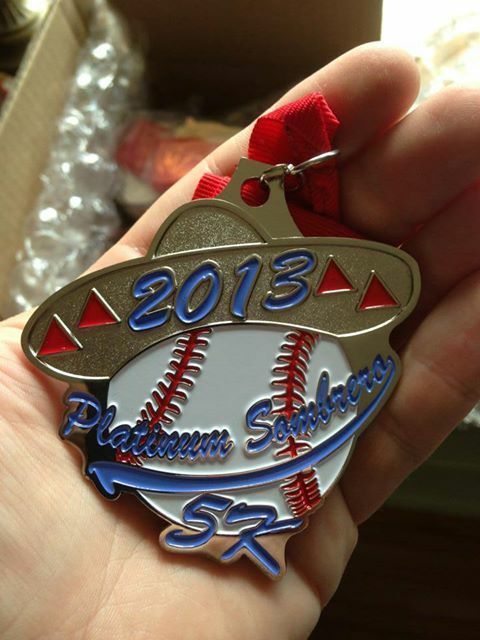 I have constantly updated my blog with Platinum Sombrero 5K information and I know several of you thought I only had a blog for this event, I know Susan did. Well, the event has come and gone, and this will be one of my last posts about PS5K. You can find further information here if you missed any of the prior posts. I learned quite a bit from this experience and will be able to use this new-found knowledge on my next virtual event. The feedback that I have seen has been positive and I truly hope that everyone had as much fun participating in this event as I did coordinating it. Susan joked that she was going to make one of those large, fake checks for me to present to St. Jude. Now that would be awesome! I chose St. Jude Children’s Hospital to be the charity of choice for this event for several reasons. 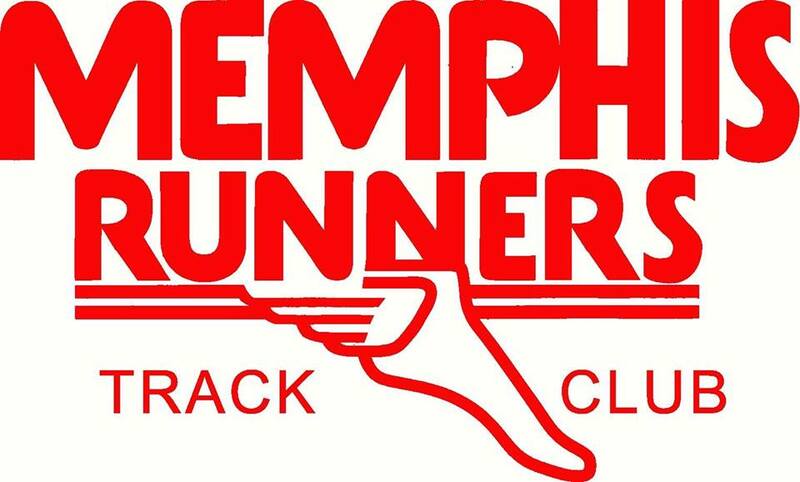 First, I am running the St. Jude Half Marathon here in Memphis again this year. The race has an option to run as a St. Jude Hero, and actually, all early registrants were required to be heroes. My fundraising minimum was $500, so instead of asking family and friends for donations, I wanted to be a little more proactive. Second, St. Jude is not a cheap place to operate, but they never charge their patients a dime for treatment. This is no easy feat when your daily operating cost is $1.8 million! I broke down the costs and benefits in a previous post. Third, I live in Memphis, and St. Jude is probably the most positive thing going for this city. Therefore, sharing this wonderful place with others felt like my civic duty. And fourth, I was involved with St. Jude fundraising through the Up ‘Til Dawn program in college. This involved quite a bit of patient interaction and several tours of the St. Jude facility. After one tour of the hospital, you cannot help but want to raise money for these children. Thus far, we have raised $709.77 for St. Jude! This money is the product of $1,250 in race registration fees and one $40 donation from a very kind race participant! The number can go up a little bit since Lock Laces has agreed to donate 20% of all sales using the promo code KYLEJUDE. This promo code is also good for free shipping, so shop away! The promotion is good until August 13, 2013. I had to post this pic! There are countless virtual races being hosted out there and I wanted mine to stand out. Therefore I worked tirelessly to get as many top-notch sponsors for this race as I could. I wanted to reach as many people as I possibly could for St. Jude. And since I had a baseball theme, I knew that I was not advertising to as broad of a fan base as I would with a Star Wars or Harry Potter them might do. Also, it seems that the vast majority of virtual run participants are female (more on this in a little bit), so I had to find ways to reach them. I ended up securing twenty-nine race sponsors for the event! I honestly thought that I would be able to get six or seven sponsors, so it just goes to show you the power of hard work and a good cause! Look at all that race swag! With the medals and all of the swag that each race participant received, every participant ended up with more products than their original $25 registration fee could purchase! 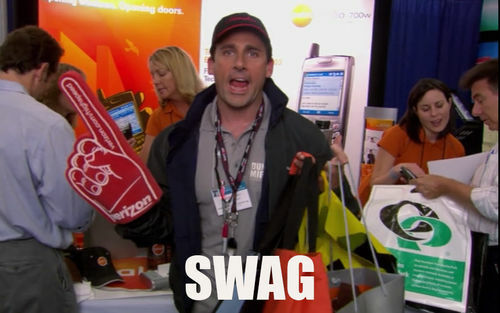 In fact, several race participants eclipsed the $75 worth of swag plateau! All race participants received a Road ID coupon, Banjee wrist wallet, KT Tape sample, Climb On! 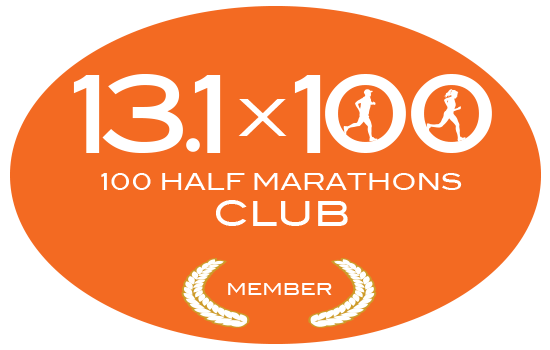 skin product sample, Ion reflective iron-on patch, one month subscription to Bulu Box, and an awesome race medal. I also gave away had seven $15 Road ID gift cards, five Today’s Miles tech shirts, four Armpockets, one Trigger Point foam roller, one Nathan Quick Draw Plus water bottle, three Polar Bottle water bottles, two Headsweats hats, one pair of Pro Compression socks, two pairs of SL3S compression socks, three pairs of Balega socks, two pairs of Zensah socks, one FlipBelt, one SPI Belt, one medal hanger from Running On The Wall, two cases of Zola coconut water, six Bic Bands, two Sweaty Bands, ten Run Guard products, two Cyclone Cups, ten pairs of Lock Laces, and one Energy Bits sample pack! 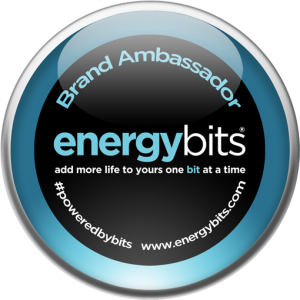 Energy Bits, Lock Laces, Spriggsville, Hydrapak, Headsweats, Fuelbelt, and Glimmer Gear all created discount codes for race participants, which can be found here. I could not have been happier with how the race medal turned out. I contacted the fine folks at Crown Awards, told them exactly what I wanted, and they nailed it! I did not have to do any tweaks or changes. The medal they designed was even better than what I had designed in my head. I was nervous that the sombrero on a baseball was not going to work out, but there is no doubt what is conveyed in this medal. I hope that everyone likes this medal as much as I do. I also was able to get some fan packs and other materials from numerous MLB teams since this was a baseball themed race after all. It was very interesting to see what each team would and would not donate for the event, and I am generally surprised by the number of teams that did not respond to my requests. 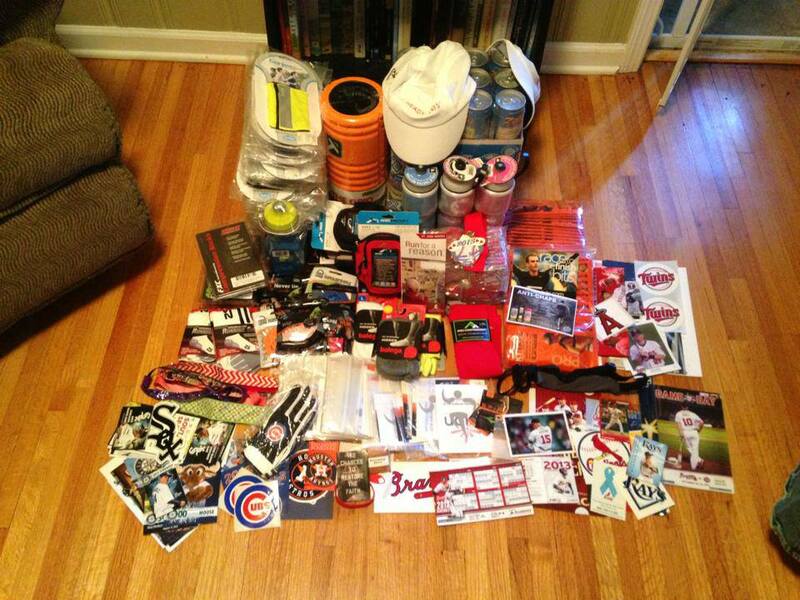 I would like to thank the Atlanta Braves, New York Yankees, Boston Red Sox, Arizona Diamondbacks, Houston Astros, Minnesota Twins, Chicago Cubs, , Cleveland Indians, Chicago White Sox, St. Louis Cardinals, Los Angeles Angels of Anaheim, and Seattle Mariners for sending fan packs to be used as race swag. Toronto Blue Jays and Oakland Athletics would have sent something, but it required me to send them a self address, stamped envelope, and since there were no race participants that listed these two teams as their favorite team, I did not bother sending in the requests. I did send in the request to the New York Yankees, but as of this date, I still have not received their fan pack. I am sorry Yankee fans. I also based the race bibs on the favorite team for the race participant. The color of the race number, and the number itself reflected your team. I wanted to get very creative with the design, but I decided not to push any copyright issues and played it safe. I started on race numbers with the team’s retired numbers, and then moved onto the biggest stars currently on their team. For example, the Baltimore fans got race bibs with an orange number eight (Cal Ripken, Jr.) and an orange number five (Brooks Robinson). I also did my best not to double up on race numbers, but this was easier said than done. There could not have been a race without any race participants, so I would like to extend a heartfelt thank you to each and every one of you. There were fifty total race participants, including myself, and the vast majority of the country was represented in the race field. 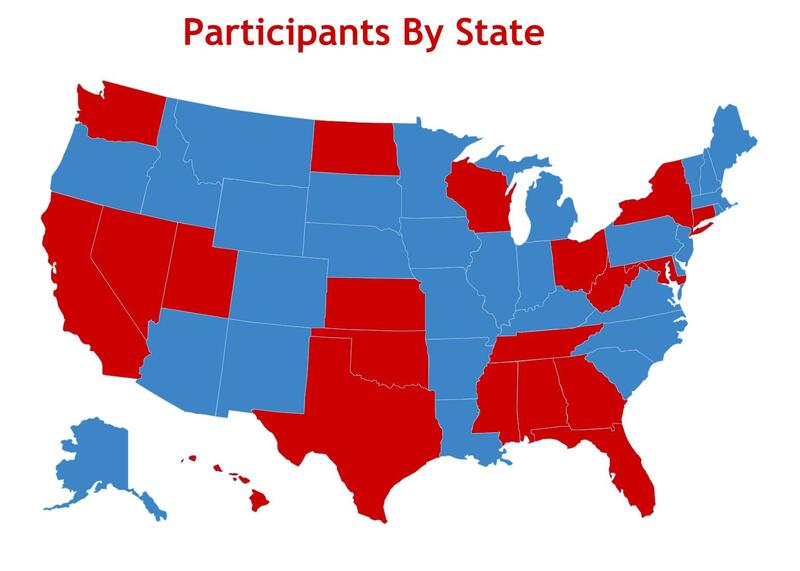 As you can tell from the map above, we had participants from Tennessee, Mississippi, Alabama, Georgia, Florida, West Virginia, Maryland, Ohio, New York, Wisconsin, North Dakota, Kansas, Oklahoma, Texas, Washington, Utah, Nevada, California, and Hawaii. I was quite surprised with some of the states that were represented, especially having multiple participants from Hawaii and North Dakota! I was also shocked by the gender disparity in the participants. The final count was forty females to only ten males! I would have never guessed that prior to the event. We also had at least four groups of mother and son teams run the event together, and one mother daughter race group, which is awesome! Registration started off very slow, and I was getting discouraged, especially with the amount of work I had put in, but by late May, it was obvious that this thing was going to sell out! Sadly, I had already ordered the medals or I would have tried to bump this event to one hundred participants. I am still getting emails and Facebook messages about any race openings. The race ended up having fifteen MLB teams represented by their fans, which is good for half of all of MLB. I wish I could have given MLB swag to each participant, but with these splits, this was not possible. The Atlanta Braves led the way with thirteen fans participating (go Bravos)! The second most represented team was the Boston Red Sox with six, then it was the St. Louis Cardinals with four. The Chicago Cubs, Cincinnati Reds, and New York Yankees had three fans apiece, and the Baltimore Orioles, Colorado Rockies, and Minnesota Twins came in next with two fans apiece. The Chicago White Sox, New York Mets, San Diego Padres, Cleveland Indians, Miami Marlins, and Seattle Mariners all had one loyal fan in the Platinum Sombrero 5K! Being that this was a virtual race, you could run it on any day that you wanted to run it. It was officially scheduled for July 13, 2013, and know that several people, including myself, ran it then. This date also happened to coincide with the MLB All-Star Game 5K, which I guess they started to hear the good publicity for my event and wanted to piggy back off of it! From the reports that I have gotten, the race went well for everyone. Some completed it on an elliptical, some on a treadmill, some braved this brutal summer heat, and some had to break up the distance due to injury. It was great to hear how many participants got out there and ran the race, with their race bibs nonetheless! The summer heat has come to Memphis with a vengeance this week, and my runs have reflected it. Even waking up at the crack of dawn has not provided much relief from the high temps and crippling humidity. Monday: Rest/recovery day since I ran my long distance on Sunday rather than Saturday last week. Tuesday: I ran 4.5 miles on the treadmill at the gym since I missed my early morning run window by helping Susan in her classroom. I hung letters, moved boxes, and kept her on task most of the day and we actually accomplished quite a bit. I considered the hours of activity there a part of my weekly training. Wednesday: I did my first TRX workout since I was on vacation during the first week of June! I did a whole body routine for about 40 minutes. I hurt afterwards, but it was definitely a good hurt. I was happy to finally return to TRX. I wish my new gym offered free TRX classes like my old one did. That once a week in class helped me stay on task. I have to get more diligent with my cross-training again. Thursday: Another 4 miles on the treadmill at the gym. This was my first run with a podcast, and I actually enjoyed the change of pace from music. I listened to the Atlanta Braves Talk Podcast, and being a Braves dork, I really enjoyed it. Friday: I ran the latest that I ever have during my young running career. I did not hit the streets until after 9 pm, and did not return home until 10pm! This was by far my best run of the week despite the darkness and more blisters from my new shoes. 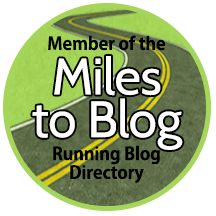 I tried the Let’s Run Disney Podcast and loved information the podcast provided for my future runDisney adventure. Saturday: Easy day since my weekly long run was looming. I did some planks, situps, and pushups during the early afternoon, but not much else. I went to dinner with my in-laws at one of their friends’ house. We had BBQ ribs, pork shoulder, and all of the fixings. We also had homemade ice cream and chocolate cobbler. The food was excellent, but was not the best meal to eat the night before a long run. The Irish whiskey was also not the wisest of choices, but I did enjoy it. Sunday: I woke up at the crack of dawn and ran 10 miles this morning. It was 10 humid and slow miles, but it was still 10 miles. I am going to try out a foam roller for the first time ever later on this evening. I am very eager to see how it goes tonight. From everything that I have heard or read, a foam roller can only help with my running aspirations. I was styling w/ this! I also tried out KT tap for the first time this week. 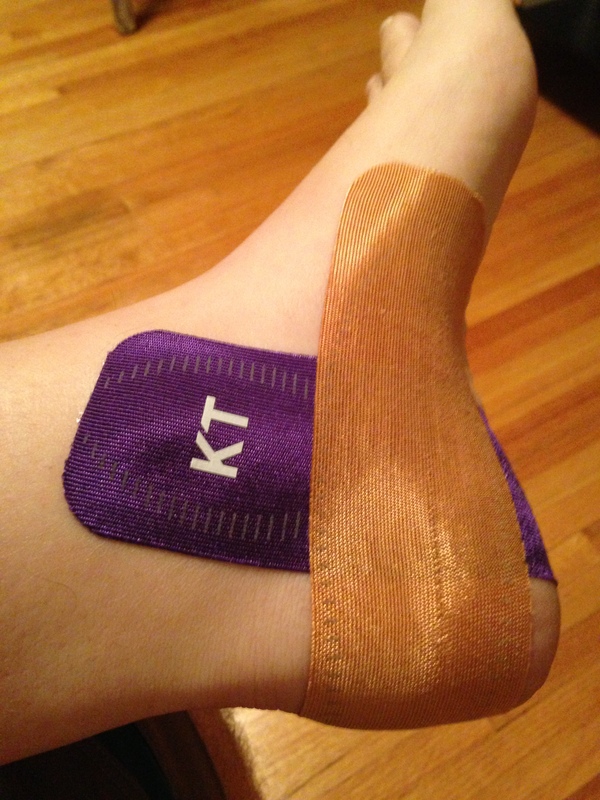 My left foot was a little sore, so I put on the KT Tape Pro as if I was about to have another struggle with peroneal tendinitis. The tape worked like a charm and once it was on, I never noticed it again. The instructions were very easy to understand, and I did notice some pain relief. I am intrigued enough at this point to buy a roll for myself to tryout. 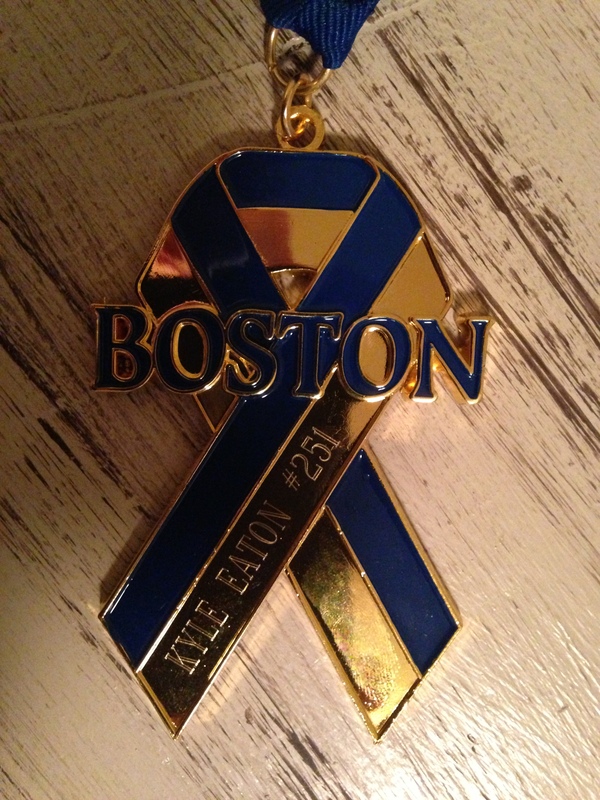 I also finally got my Boston Remembrance Run medal on Saturday. It was been over a month since the event, and I was getting a little antsy about getting the medal. The event was a virtual marathon in which you could split the miles over the course of an entire week. I split up the miles and ended up in the middle of the four hour block. I was pleased, especially when I thought that this time would marvelous to duplicate at the WDW Marathon! The people that put on the event were for helpful, but they did not know what to expect with the volume of this race and engraving process of the medals Better late than never, and I am still waiting for my socks from the event.